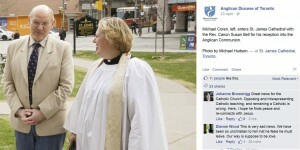 Michael Coren Flops Again, this Time Joining the Anglican Church…what group will he join next? So, a floppy commentator and author leaves the Catholic Church to become an Anglican. Michael Coren has seemed uncertain for a long time and switching around from one tradition to another. My guess is that he jettisoned the Catholic Church over the homosexual issue. Wait a few years and see what he decides to join next.